If you need a reliable all-around tent for camping, this Mountain Hardwear Optic 6 review is for you. This is a quality 3-season tent with a full coverage fly and two unique asymmetric vestibules. Mountain Hardwear Unisex Optic 6 Tent. The Mountain Hardwear has three tents in the Optic series, those include 2.5, 3.5, and this 6 person tent. So the Optic 6 is the largest in the series and currently the largest tent of this brand in general. The Optic 6 tent is a dome style structure with the usual two poles creating an X-structure, plus a short ridge pole. You might call it a freestanding tent but bear in mind that the vestibules have to be staked to the ground as usual with such tents. The Optic 6 tent shown without the fly. The two doors are next to each other. Space-wise, the tent is with the declared capacity of 6 people. But the inner area is very small, 86 ft² (8 m²), which means 14.3 ft² (1.3 m²) per person. This might work for a backpacking tent, but this is not the type you have here. So it really surprises me when I see in some descriptions people write about its large space. Yes, it is large, but bear in mind its declared capacity. There are two asymmetric vestibules that add some covered space, so the total protected area looks better, you have 112.6 ft² (10.5 m²). But I still think that for a real camping you should not plan more than 4 people in this tent. Parents with a small kid or maximum two might have enough space. See the floor plan below and what they suggest for using the floor for sleeping. Seasons-wise, the tent is with a very good waterproof rating, with a full fly, and with reliable aluminum poles. So you will be protected in any weather conditions in a 3-season use. But this is indeed a very tall tent and it would be better to avoid very strong winds. Climate-wise, this is a tent for a warmer climate. The fly covers it completely but there is lots of mesh on the inner tent so this cannot preserve the warmth and you should not use it in a cold environment. If you need such a tent, better check this Crua Dome 6 tent or some of those with solid windows like the Coleman Rocky Mountain 5 Plus tent. Weight-wise, with 16 lb 13.7 oz (7.6 kg), this is a reasonably lightweight tent and if you look around you will realize that it is lighter than many other 6-person tents. But there are lighter options, like this Eureka Midori 6 and EXIO 6 tents. So although it is portable, I think it is best to use it at places where you do not have to carry it yourself. Note that they give also the minimum weight (see below in the specifications), but this terminology is never clear unless the manufacturer describes what it really implies. For such a huge dome with the peak height of 77 inches (196 cm), the two poles look not enough. But those are not ordinary poles, you have DAC DA-17 type here. If you are not familiar, this type was developed by DAC specifically for large family camping tents, and they have revolutionized the tent building industry by allowing for larger spans with fewer poles. So they are strong but flexible. The fly is 70D 190T nylon taffeta with 3000 mm rating, and this looks reasonably durable. You have two vestibules and one allows for the awning configuration with the help of your trekking poles; you can see this in the picture above. 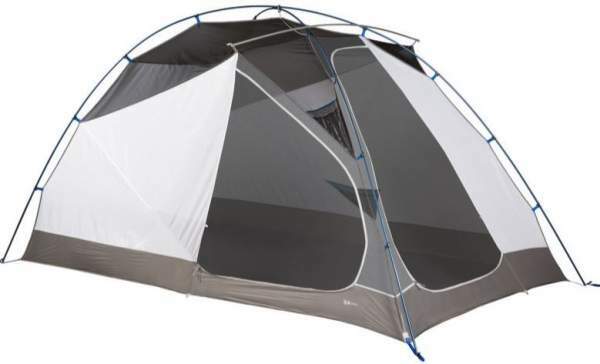 This fly design is what sets this tent apart. However, the floor is the same material and with 3000 mm waterproof rating, so this is not very durable for such a camping tent. The canopy is 75D polyester taffeta. The doors are its best feature, and this is related with the fly and vestibules design. The reason is that they have positioned the doors side by side around the same corner. So you have a large angle for views around. This is all mesh of course and this is on purpose to have such great views; but you have taffeta panels around. So when the vestibules are rolled out, these doors serve as two huge panoramic mesh windows. As long as you can keep the vestibules open, there should be no problem with ventilation in such a tent. The mesh in the inner tent and on the doors will provide it enough. But there are no vents in the fly and this is not so great if you have to keep the vestibules closed. The sky is not always clear as we all know. Reflective color coded starter tab on the rainfly and canopy. Guyout lines and line tensioners included. Several mesh pockets are available for off the floor storage. A divider and gear loft can be ordered separately. Optional oversized footprint can be ordered separately. Small inner area for the declared capacity. The current price for this tent on Amazon is $399, so it is expensive but the price is similar to what you have in some other tents of this type. Bear in mind this is a quality item from a renown brand. But there are more affordable options, just see this ALPS Mountaineering Taurus 6 as one example, or this Slumberjack Trail Tent 6. Packed weight: 16 lb 13.7 oz (7646 g). Minimum weight: 15 lb 12.6 oz (7160 g). Dimensions: 167 x 126 in (424 x 319 cm). Inner area: 86 ft² (8 m²). Inner area per person: 14.3 ft² (1.3 m²). Vestibules area: 17 + 9.6 ft² (1.6 + 0.9 m²). Total protected area: 112.6 ft² (10.5 m²). Total area per person: 18.8 ft² (1.75 m²). Packed size: 31 x 11 in (79 x 28 cm). Peak height: 77 in (196 cm). 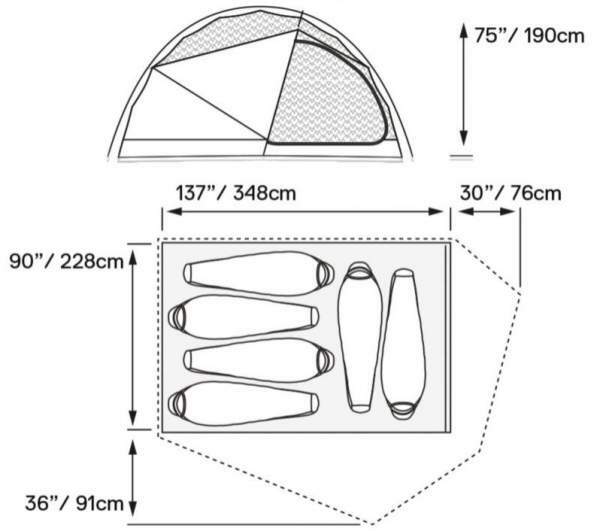 The best way to realize the meaning of some of the features is to put them side by side with other tents, this might give some idea of what the tent offers. So here I give it with two quality tents from renown brands. As you see, it is heavier and its packed size is not as good as in other tents. Also, the vestibules are not particularly large, you will realize this if you follow the links and compare. The Kelty’s tent is far more affordable and it comes with the footprint included. In the summary of this Mountain Hardwear Optic 6 review, I wish to stress that they built an interesting and reliable tent. But I do think it is far too small for the declared capacity. The price is steep but the tent is worth the money, the craftsmanship is at a high level and the tent is durable. Above all, the design is unique and very pleasant as long as the sky is clear. Though they have missed adding vents and I had to stress this. Thank you for reading. If you need to see more options, start with the tents in this same size category, so check 5-6 person tents, and then search further. This particular group has many types of tents so you will find something for you. Check this Mountainsmith Cottonwood 6P Tent which is lightweight enough to be carried on the trail. If you need a canvas 6-person tent, check this Teton Sports Mesa 14 Canvas Tent and also this Alpha Kilo 4000 Canvas 6 Person Bow Tent which is a dome style 4-season tent. Please use the comment box below in the case of questions or comments. Have a nice day.